I have not had the pleasure of hearing Sakari Oramo's performances of Elgar, but I am sure they are very fine. But I can assure him that I heard many live performances of Elgar conducted by Boult and 'stoic stodginess' are the last words I would use to describe them. But then I don't think Oramo would know about his live performances. The last time Sir Adrian conducted in the concert hall was on October 12 1977, when Oramo was 12. After his last concert appearance in London Sir Adrian conducted several more ballet performances of Elgar's music (The Sanguine Fan and Enigma Variations). 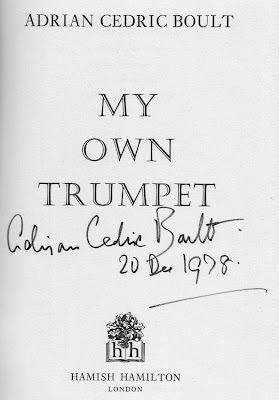 He also continued to record, and on December 20 1978 completed the sessions at EMI's Abbey Road Studios for an LP of Sir Hubert Parry's Symphonic Variations, Fifth Symphony and Lament for Brahms. We knew this was to be the last ever recording session for the 89 year-old conductor, and he kindly signed and dated my copy of his autobiography, seen above, after the session on that historic day. Sir Adrian Boult was both a wonderful musican and one of the greatest-ever interpreters of Elgar's music. He was a conductor who built his reputation in the concert hall and on record, not by making silly comments in newspaper articles. Now read an exclusive on the mystery of Elgar's Violin Concerto. The following letter appeared in the March 7 1920 edition of Music and Letters. My attention has been called in the last week to a sentence in an article on myself in your first number, which mentions a clique associated with the name of Sir Hubert Parry. Cliques have always existed in music and always will exist; they do not matter. All I am concerned with is the mention of Sir Hubert Parry's name, with the implication that he in some way slighted me. This is quite a mistake. The moment to enumerate the many occasions on which Parry advised me is not now; I hope to make known all I owe to his ungrudging kindness at some future time. I was interested to read your justifiable kicking of the smug comments of Mr Oramo who seems to condemn "British" conductors of the past of being fatally flawed interpreters of Elgar. I salute your robust response!! I've no idea if Oramo is a good conductor, but he is a silly little man. The trouble is he has been brought up in the age of spin, and thinks he can make a name for himself by what he says rather than with his baton. Your comparison with Lebrecht is apt. It is particularly ill-considered as Boult was at the CBSO, and Rattle admired him very much. Perhaps that is the trouble? Enough of this already. How many non-British conductors of British orchestras (or British conductors, for that matter) have done a fraction of what Sakari Oramo has done for British music? I've been a regular concert-goer in Birmingham for some years, and I've heard him conduct Constant Lambert, late Vaughan Williams symphonies, Bax, George Benjamin, Sullivan, Julian Anderson and electrifying performances of Britten. He's conducted Gerontius countless times, and The Apostles and The Kingdom at least twice. His Frank Bridge is, in my view, superior to Charles Groves'. And he's achieved more for John Foulds in 5 years than Foulds' British supporters managed in 5 decades. He has at least as much right to be talking about British music, I'd guess, than either of the posters above. I deal professionally with the CBSO and can assure you that the Guardian article was not written by any member of CBSO staff. Oramo speaks English like a native; why this difficulty in accepting that he might have written it himself? As a devoted Barbirolli fan, I admit to being a little perplexed by his comments - but bear in mind that, in ten years of world-class work in Brum, Oramo still has to put up with London critics comparing him (albeit usually favourably) with his predecessor? Might this have a bearing on his attitude? And might he not have a deeper point? Is it not possible that the geeky British obsession with "definitive" performances - and the deeply parochial view that only a certain group of (mostly dead) British conductors can say anything valid about Elgar - has actually damaged Elgar's reputation overseas, and inhibited performances? On the strength of poisonous comments like Pliable's, any foreign conductor could be excused for giving British music a wide birth. But Sakari Oramo is bigger than that. He's taking Boult’s and Barbirolli's work forward into a new and different world. Elgar can take it. So deal with it. MV Overchurch, please read the post and the comments. Sakari Oramo's commitment to British music was not questioned. His wisdom in using inaccurate comments about one of his predecessors in Birmingham to promote his own concerts was. Sorry to get carried away. It's the comment "The trouble is he has been brought up in the age of spin, and thinks he can make a name for himself by what he says rather than with his baton" that made me see red. That sounds very much to me as if Oramo's artistic achievement is being questioned - when in fact he's long since made a superb name for himself using his baton. Has any other non-British conductor this year written anything so provocative about Elgar? That in itself is interesting - Oramo has an absolutely unique perspective on British music. We in Britain love our Boult and Barbirolli discs; to us, their's is the definitive Elgar tradition. But clearly, Oramo, a non-British musician sees things very differently. Given that his credentials in this repertoire are impeccable, and his commitment is beyond question maybe it's worth thinking about why that is? We might still disagree with his views, but let's at least take them seriously. The implication that his opinions on this subject are based on ignorance - or, even worse, self interest - is unworthy of a serious discussion forum. When a musician makes a provocative statement it is the role of a discussion forum to debate it, not ignore it. As I said before Sakari Oramo's credentials as a conductor, an Elgarian, and a champion of British music have not been questioned here. But MV Overchurch, the City of Birmingham Symphony Orchestra, and Mr Oramo himself are going to have to accept that making the comments he did in a newspaper article promoting his concert of Elgar was a mistake. The medium he chose to publish in is commonly used for spin by self-interested parties. His comments were not inclusive. He failed to mention a very different take on Elgar by another English conductor, he failed to highlight Boult's more urgent (and more difficult to find) Elgar interpretations such as the 1944 Second Symphony (LP ED 2903551), and failed to highlight ruinously slow Elgar interpretations by non-English conductors such as Bernstein. It may, or may not, have been intentional. But the lesson for Mr Oramo and the CBSO is if you play with fire don't complain if you get burnt. Let's move on to another topic now please. This debate is now exhausted as both sides have made their point. I do think it unfortunate that an ill-advised excursion into journalism has detracted from the great work done by Sakari Oramo in Birmingham. A balanced perspective on the Finnish conductor's work with British, and other music, in Birmingham would be useful. If MV Overchurch (I note some musical Wikipedia contributions) would like to submit a max 1200 word article on this which takes into account the international readership of On An Overgrown Path (around 60% of 2000 daily hits are from the US where, for instance, John Foulds is unknown) I'd be more than happy to consider it for publication. I never heard another word from M V Overchurch.